Mario and Erma DeLucchi were running late to the auction. It was 1978, and the historic Fox Theater in Oakland was going up for sale at any moment. One company wanted to turn it into a parking lot, but the DeLucchi family were determined to save it. Mario dropped off his wife so she could get inside while he searched for parking. She arrived just in time to win a bid on the Fox for $340,000. 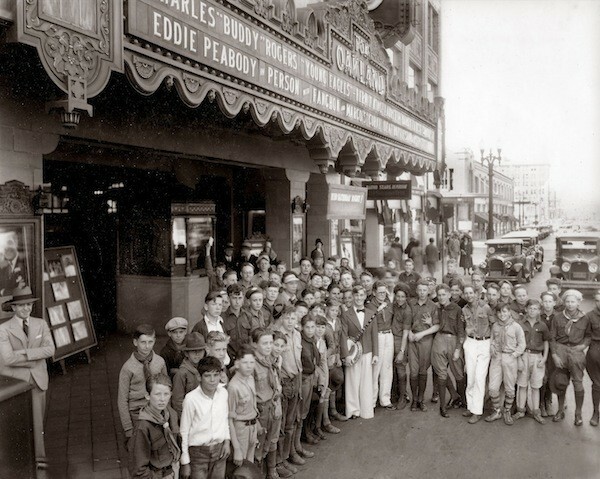 Five decades earlier, in 1928, the Fox opened as the largest theater in Oakland. Its 3,200 seats made the venue a prime space for film screenings, and less than a year later, William Fox bought it as part of his growing movie theater chain. Though it was originally to be called “The Baghdad,” due to its Middle Eastern-inspired architecture, it came to be known instead as “The Oakland.” It was lauded for its “spaciousness, luxurious appointments and beautiful designs,” as the San Francisco Chronicle wrote in 1928, and trademarked by its emblematic gold deities on both sides of the stage. The gilded guardians flanking the stage were an imposing presence, and though they’ve been re-plastered and touched up (and embellished with lights), they’re now approaching their 90th birthday. Many would consider them the most iconic facet of the Fox; however, as Production Manager Tony Leong points out, the golden twins are only a small representation of the amount of detail that went into the venue’s design. Its architecture incorporates eclectic influences, from medieval to Moorish to its resemblance to a Brahmin temple, and its sign that towers above Telegraph Avenue, illuminating the street below. The theater’s noted design intricacies, however beautiful, couldn’t save it from financial turmoil. In 1965, when the movie business took a turn for the worse, the theater closed, operating only sporadically for an event here or a screening there. In the mid 1970s, the Fox was used as the set for a low-budget horror film Nightmare in Blood about a ragtag crew of “an amateur sleuth, a comic book expert, a Nazi hunter, a mystery novelist, and a fashion designer” working as vampire hunters. Later on, it was used for a Dickens Fair, but it remained largely vacant most of the time. When the DeLucchis bought the building it was in sad shape. Mario passed not long after the purchase, and, despite landing a spot on the National Register of Historic Places, renovations on the theater were stalled. Eventually, the city of Oakland stepped in to help. In 1996, the Oakland government bought the Fox from Erma DeLucchi, and, with the help of local developer Phil Tagami (whose parents met at the Fox), the theater was restored to its initial glory—with all its original detailing, down to the horsehair plasterwork within the building’s walls.You can still see the Tagami family seal on the doors leading into the concert room. In a nod to the past, they resemble film reels. “The redesign is a great hybrid of history and practicality,” says Leong. That blend has brought big name acts of all kinds to the venue, including Lorde, DEVO, Sam Smith—and even the President Barack Obama. But these days, since Another Planet Entertainment took over, the Fox is all about the music. “Atoms for Peace played a legitimate third encore,” Leong points out. “The house lights were up and half the audience was in the lobby when Thom Yorke went back on stage. They had heard the crowd all the way from downstairs, which is nearly impossible.” Yorke went on to lead a 15-minute jam session that night, and again the following night. Equall impressive is how fond musicians are of the space. In an effort to respect the green room, Skrillex, a huge fan of the Fox, held off on his trademark chain-smoking for the night, out of respect. And Green Day used the venue as the setting for their song in Guitar Hero. Dave Grohl was so taken with the Fox and the surrounding neighborhood that, several months after his show, he flew his wife up in a private jet for a special date to see a Scissor Sisters show. Today, nearly 40 years later, it’s hard to imagine that none of this would have happened had the deLucchis been only a few minutes later.